Notes: Edge Lane station was situated on the London & North Western Railway (LNWR) Canada Dock branch which ran from Edge Hill to Canada Dock. The line was authorised in 1861 and its primary purpose was to give the LNWR access to the most northerly of the Liverpool Docks. The LNWR had goods stations at Wapping Dock (opened October 1830) and at Waterloo (opened 1 August 1849) but since these stations had opened the docks had continued to spread northwards. The Canada Dock branch did not take a direct course from Edge Hill to Canada Dock owing to the topography of the area. It ran in a north/south direction through Edge Lane at a distance of about two miles from the river front. Only when it reached Anfield did it start to turn towards the west and head down to the docks. The double-track line opened in two stages, the first being from Edge Hill to Tue Brook on 1 June 1866. Passenger and goods services were run. On 15 October 1866 the line was opened from Tue Brook to Canada Dock but only for goods services. The passenger service continued to run only between Lime Street and Tue Brook until 1 July 1870 when a passenger station opened at Canada Dock. Edge Lane was opened after the passenger service had been extended to Canada Dock, first appearing in the timetable in November 1870. It was located in a cutting on the south side of its namesake which passed over the line on a bridge. The station had two platforms both of which were linked to Edge Lane by sloping footpaths. The main facilities were on the up platform (Liverpool direction). They were housed in a single-storey brick building of restrained elegance. The roof was of a half-hipped style above which rose two tall and slim chimneystacks. The doorway from the platform into the booking hall was beneath a segmental arch. To its right were two triple round-headed window openings, with a similar triple window to its left. Bricks of alternating colour added decoration to the window heads. An unadorned toilet block was added to the south-east end of the building. On the down platform there was a smaller version of the main building, again under a half-hipped roof, and with a single tall chimneystack. This building, too, had a toilet block at its south-eastern end. There were no goods facilities at Edge Lane station; they were located at Stanley station which was only 32 chains to the north. 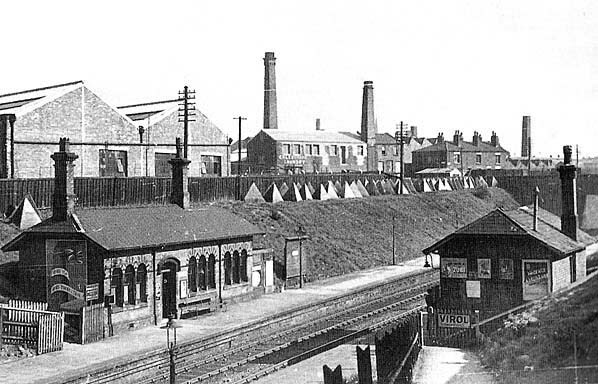 On 5 September 1881 a line was opened from Atlantic Dock Junction (just east of Canada Dock) and Alexandra Dock. Passenger trains ran along the new line between Alexandra Dock and Liverpool Lime Street. Down services from Edge Lane alternated equally between Canada Dock and Alexandra Dock. The December 1895 timetable showed 30 up and 31 down trains on weekdays. For much of the day Edge Lane had a half-hourly service. All of the up services ran to Liverpool Lime Street and the down services were still split roughly equally between the two northern termini. On 6 October 1912 the Liverpool Corporation opened an electric tramway along Edge Lane. A frequent service was operated that competed with the railway for passengers. The trams offered a greater range of destinations in the city centre than the railway and this drained revenue from the LNWR services. The Canada Dock branch was a very busy freight railway and during the Great War. It handled huge volumes of war-related traffic as Liverpool had become the major west-facing port. By July 1922 the passenger service had been reduced to 18 up and 19 down services. The down service pattern had also altered, there being only five services to Canada Dock but 14 to Alexandra. 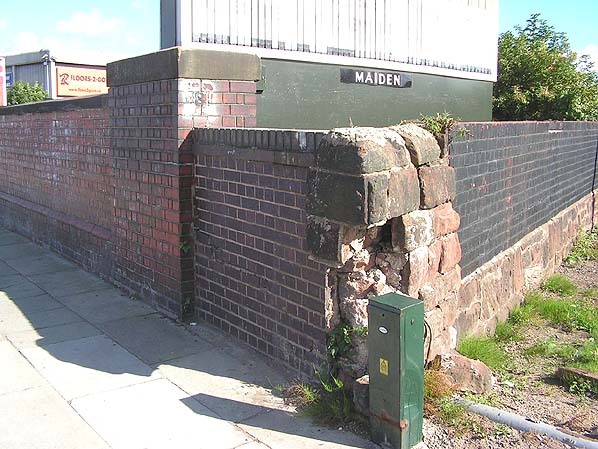 On 1 January 1923 Edge Lane became part of the London Midland & Scottish Railway (LMS). The LMS summer timetable for 1932 showed five trains from Edge Lane to Canada Dock, 12 trains to Alexandra Dock and 17 to Liverpool Lime Street on weekdays only. During the 1930s the bridge that carried Edge Lane over line was widened. The outbreak of the Second World War on 3 September 1939 meant that once again the Canada Dock branch had a key role to play. However Liverpool found itself in the direct line of fire and suffered heavy bombing from December 1940. On 4 May 1941 the station at Canada Dock was very badly damaged. The goods warehouse was completely destroyed by fire and the passenger station was flooded as the Leeds & Liverpool Canal had been breached by a bomb. Passenger services to Canada Dock were suspended and they were never reintroduced. Edge Lane was left with the Liverpool Lime Street – Alexandra Dock service. The summer 1947 timetable showed a much reduced service of only five trains to Alexandra Dock, one to Spellow and six to Liverpool Lime Street on Monday-to-Friday only. On 1 January 1948 Edge Lane became part of British Railways [London Midland Region]. As a passenger station it did not survive long after Nationalisation, closing on 31 May 1948. A passenger service between Liverpool Lime Street and Spellow (the last station before Atlantic Dock Junction, opened in September 1882) was shown in the summer 1949 timetable with only one train in each direction. It is not known if the service actually ran and, if it did, Edge Lane was not served. Passenger services continued to pass through Edge Lane after the withdrawal of the local service in the form of through coaches between Southport and Edge Hill. The coaches were attached to/detached from Liverpool – London Euston services. In the second half of the 1960s the through coaches were replaced by DMUs which ran until 9 October 1977. In 2017 there was no trace of the station but the line remained busy with freight trains. 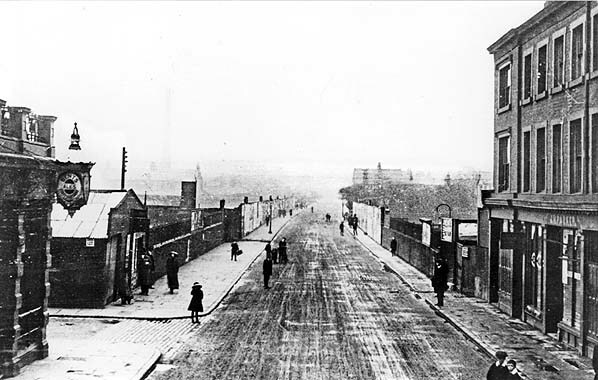 A view looking east along Edge Lane in the early months of 1912. The entrance to Edge Lane station is to the right beyond the buildings. Later that year a tramway was opened along Edge Lane. Edge Lane station shown on a 6-inch scale map from 1889. Edge Lane station shown on a 25-inch scale map from 1905. Edge Lane station shown on a 25-inch scale map from 1925. This map shows the tramway which had opened on 6 October 1912. Looking north along the down platform at Edge Lane in 1948. A mixed goods train is seen passing through the station in the up direction. 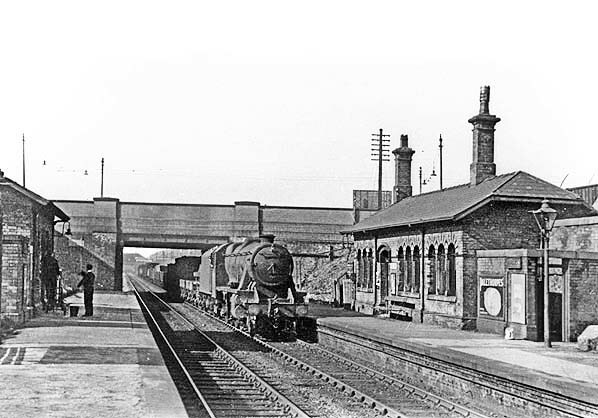 Edge Lane station looking south in 1948. The path in the foreground connected to the down platform. 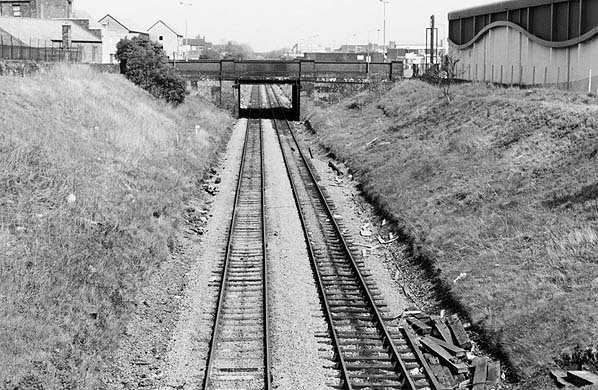 The site of Edge Lane station looking north in May 1988. 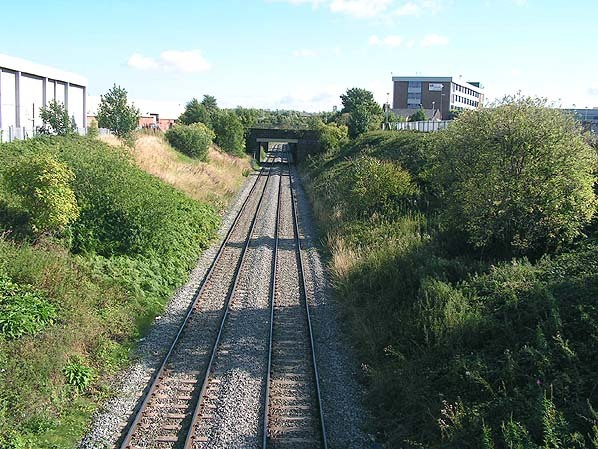 Looking south at the site of Edge Lane station from the Edge Lane bridge in August 2005. 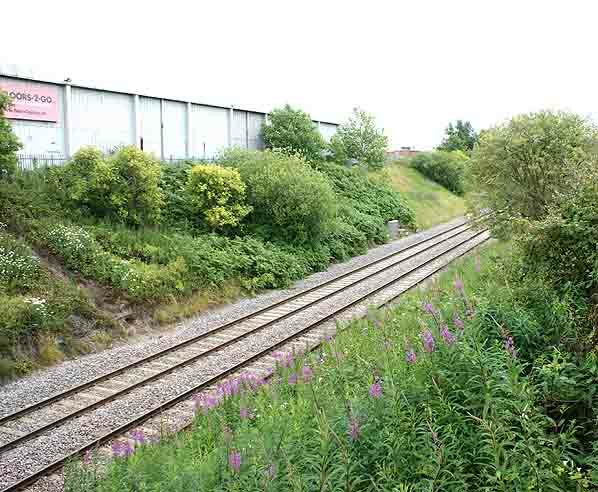 The site of Edge Lane station looking south on 9 July 2011 from the same viewpoint as the 1948 photograph above.